Put your faith into practice on a daily basis and grasp the practical truths of God's Word with this in-depth commentary on James from Internationally renowned Bible teacher.James has so much to say about living a powerful and effective life in Christ. The book addresses a variety of topics important to growing your faith and teaches that you not only need to read the Word of God and know what it says, but you also need to act on it. In this comprehensive biblical commentary, Joyce Meyer offers you practical insights for studying the book of James, with room for personal reflections that will help you grasp the truths in God's Word. 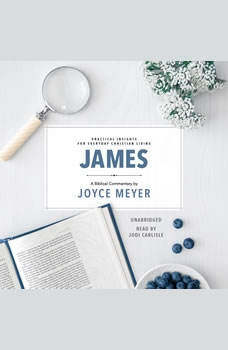 You'll discover how to identify life-changing wisdom and get a better understanding of God's plan and purpose for your life.Part of her first-ever biblical commentary series, Joyce's book on James will stir your faith in God and inspire you to live it out in practical ways because of your love for Him and desire to glorify Him in your life. Sometimes we cannot know the difficulties people go through, unless they are willing to share their experiences. Such is the life of Pauline Joyce Hutchison, now, Joyce Meyer, Christian author, speaker, and president of Joyce Meyer Ministries. Joyce spoke often in her discussions about being sexually abused by her own father after he returned from World War II. As happens many times to such children, she married shortly after her senior year in high school, done usually to be able to leave the home where abuse happened. That marriage lasted only five years and was filled with unhappiness with a cheating husband. He even persuaded her to steal against her own better judgment. She says that she returned that money years later. After her divorce, her life was very tumultuous as she went from bar to bar aimlessly, until one day she met her future husband, Dave Meyer, an engineering draftsman. They were soon married, and remain married today. Joyce relates her story of "a Jesus moment" when she was driving to work one day in 1976. She said as she drove she heard God call her name. All day she felt energized with the spirit of God, even as she participated in bowling at the local bowling alley that night. Meyer began serving in a local church in St. Louis, leading an early morning Bible class. Eventually, the church became one of the most popular in the area, mostly due to Meyer's popularity as a Bible teacher. At the same time, she began a 15 minute radio broadcast on a local radio station. In 1985, Meyer started her own ministry called "Life in the Word". By then, she was on six additional stations including Chicago and Kansas. Her husband Dave suggested she start a television ministry in 1993, which was the beginning of her current program, "Enjoying Everyday Life, which still airs today. Meyer has written over 100 books, and has sold and given away billions of copies. In 2002, Hachette Book Group paid Meyer over $10 million for her catalog of independently released books. In 2005, Time magazine named Meyer among their "25 Most Influential Evangelicals in America". Meyer was ranked at number 17. "Joyce is and continues to be an incredible testimony of the dynamic, redeeming work of Jesus Christ."